Abstract: Acute renal failure may complicate the course of a hematologic malignancy but is a highly unusual finding in patients with chronic myelomonocytic leukemia. 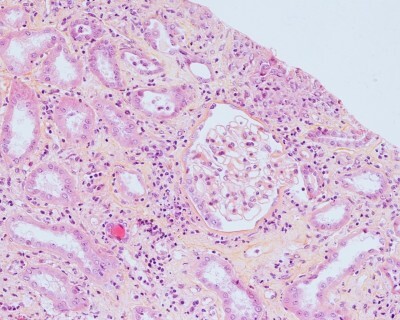 Kidney biopsy is rarely performed in this setting, and the pathologic substrate underlying kidney injury is not well identified. We present a case of a biopsy-proven acute tubulo-interstitial nephritis due to massive infiltration of neoplastic myelomonocytic cells. Since the leukemic process involving the kidney may respond favorably to treatment, a renal biopsy should be considered in any patient presenting with unexplained severe or evolving kidney disease.